Throughout the Easter weekend, Belgian Mariembourg was the venue of the X30 Challenge Europe. More than 120 participants from more than 20 nations fought for the first big international title. German chassis manufacturer Mach1 Kart sent in three drivers. Unfortunately, this disadvantage was obvious throughout all three heats. Julian lost a couple of positions on the first few meters, but was able to prove his strong will and fought his way back. Coming in on eighth, ninth and fourteenth places, he qualified for the first final race as the great sixteenth driver. Despite his position in midfield, Julian had his hands full on Sunday. Numerours quarrels made the race really difficult. By achieving two 19th places and the overall 17th place, he still stayed the best German driver of the field though. „Julian has experienced three great racing days. His performance was really good and ranking among the top ten was within our grasp. During the finals, the quarrels unfortunately cost a lot of important time“, explained a content Martin Hetschel. The juniors Philipp Heim and British Lewis Kent broke new ground. Both of them started at such a big event for the first time and had to collect racing kilometers. Both of them did very well and were able to continously shorten their backlogs. 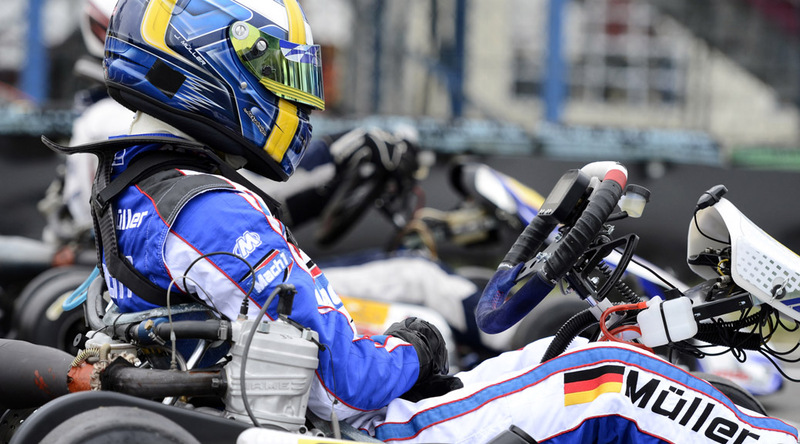 As a private driver, Maximilian Bauer started in a Mach1 kart at the juniors as well and did a great job. On the overall list of rankings, he ended up on the great 20th place.